Arkebe Equbay, a one-time rising star of the Tigrai Peoples Liberation Front and former mayor of Addis Ababa, has fled to the United States seeking asylum, according to reliable sources. 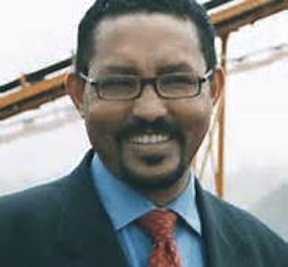 Also defecting is Getachew Equbay, Arkebe’s brother and former executive of Mesfin Engineering. The brothers are said to have escaped along with their families. According to Wikileaks, in 2008, the majority of TPLF leadership had voted for Arkebe to lead the politburo. Arkebe is said to have wisely chosen not to antagonize Meles. Arkebe was nevertheless unceremoniously purged from the politburo by the vindictive former prime minister two years later. Just last year, Arkebe was thought to be the heir apparent to the throne following the demise of former Prime Minister Meles Zenawi. Unconfirmed reports are also circulating about the defection of many frightened TPLF biggies who refused to return home after traveling to the US. This month marks the second anniversary of Eskinder Nega’s imprisonment. When you visited Ethiopia in May, Eskinder Nega had already been imprisoned – and thus silenced – for over a year. It’s time for the United States to use its considerable influence to vigorously and directly advocate Nega’s freedom and, in the process, to promote free expression and independent journalism throughout Ethiopia. Now is a crucial moment for the Secretary to speak out. Over the weekend, Ethiopian security forces in Addis Ababa brutally suppressed a demonstration calling for political reforms and the release of jailed journalists and dissidents. Eskinder Nega is an internationally recognized Ethiopian reporter-turned-blogger. His award-winning journalism on political issues in Ethiopia – and his refusal to stop publishing or flee the country – has made him the target of persecution by the Ethiopian government for many years. Nega was arrested in September 2011 and then convicted under a new, extremely broad anti-terrorism law in Ethiopia. Nega’s so-called crime was writing articles and speaking publicly on topics such as the Arab Spring and Ethiopia’s poor record on press freedom. For that, he was sentenced to 18 years in prison. EFF has joined other free speech advocates and human rights organizations around the world in calling for Nega’s release. The UN Working Group on Arbitrary Detention has joined the movement calling for Nega’s freedom. And Amnesty International has rightly declared Nega a prisoner of conscience and is petitioning for his release. Journalists and human rights organizations around the world have condemned Nega’s sentence and called for his release. It’s time for the United States, and especially the State Department, to do the same. We’re writing today to urge you to use your relationship with Ethiopia to campaign for Eskinder Nega’s freedom and the freedom of all peaceful bloggers in Ethiopia. We appreciate the public statements that the State Department has made about Nega’s imprisonment, but that’s not enough. Nega has already spent two years in prison, and other bloggers in Ethiopia have also been silenced by similar unjust imprisonments. A free and independent media is vital to democracy and justice. We are calling on you to speak out on behalf of Eskinder Nega and raise his case with your contacts within the Ethiopian government. We urge you to more strongly tie American economic and political support for Ethiopia to its record on press freedom. The Ethiopian government should understand that the imprisonment of Eskinder Nega has real and continuing consequences to the health of its global diplomatic and financial relationships with its partners. The United States has deep ties with Ethiopia. Please use this access and influence to champion the rights of free expression and press freedom that are guaranteed by the Ethiopian constitution and international law. “Wolahi, Wolahi…” swears 85 year old Totolamo village barley farmer and cattle herder Hajji Abdinur Shifa when a reporter asked him if he know any terrorist hiding in his village. His face looks like a paint of sorrow and grief. His wife affectionately called by the villagers, Adiyo, was too fragile to talk about the August 3 2013 blood bath that turned their agriculture and livestock rich village into an inferno. “My son took three bullets and died a day later at Sashemene general hospital. The body that was weakening by fasting could not respond well to treatment and he succumbed to his wounds without saying goodbye. His killers (federal police commandos) did not allow us entry to the hospital. My son Abdulkarim is dead but he will live in my heart until I join him in paradise…,” the respected elder said wiping his tears with a piece of garment. On that fateful day, 3 August 2013, Abdulkarim Abdinur Shifa, 39, was at Erob Gebeya mosque loading onto his van sacks of barley, corn, and potato donated by farmers to be distributed among the needy in the city of Sashemene for Eid celebration. When he was about to leave, bullets started raining down and the scream of women and children filled the salubrious air of Totolamo. Tigre people Liberation Front gunmen in police uniform massacred eleven people including an elderly imam and an infant. The tragedy touched every household from Totolamo to Kofele in southwest oromyya. In the land famed for its sylvan beauty, despite the aroma of ripe corn, the stench of death still hangs in the air. The approach of the delightful month of September did not lift the gloom of the August blood bath. According to our sources from Sashemene general hospital, currently the death toll stands at sixteen- all Muslims and close relatives. Furthermore, two hundred young men arrested on 3 August 2013 are still languishing in Kofele town police prison without any charges.